Tags will be attached to the left posterior (rear) point of the prosoma (first section of body, see figure). There is a high concentration of fibrous material within the body in this area, which minimizes bleeding. Before drilling the attachment hole, clean off any epibionts (barnacles, etc.) near the attachment site. 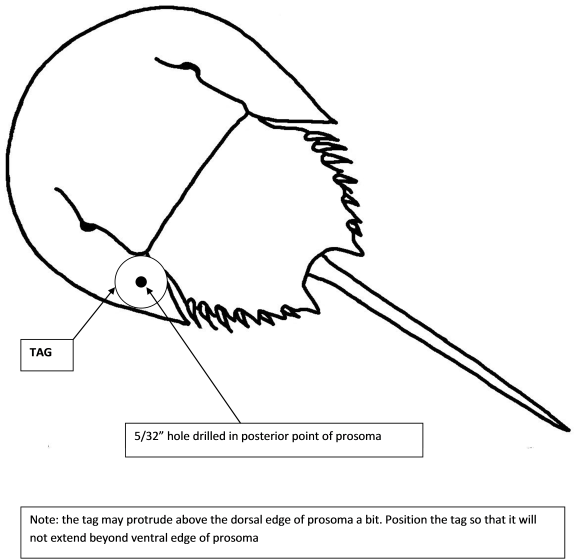 The tag is attached by drilling a 5/32" hole (7/64” for small tags) through the left side of the prosoma near the dorsal edge and then pushing the plastic pin (with tag) into the hole as far as it will go (it should NOT go all the way through the prosoma and come out the other side). A small amount of bleeding may be noticed and occasionally eggs will exude from the drilled hole. Attach only one tag per animal. 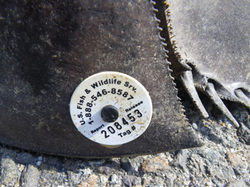 If the animal is damaged near the attachment area, attach the tag to the opposite side, or do not tag animal.